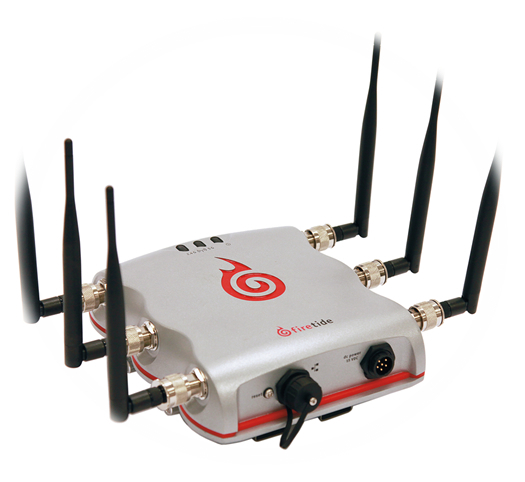 CAMPBELL, CA--(Marketwired - October 08, 2013) - Firetide Inc., the technology leader in private wireless broadband networks, announced the availability of the HotPort® 5020, a wireless infrastructure node that breaks the price barrier to bring mesh to the edge. The HotPort 5020 expands Firetide's compelling value proposition of end-to-end redundancy and security to a wide range of data, video or voice applications, delivering a more reliable solution than traditional point-to-point (PTP) and point-to-multipoint (PTMP), which expose the network to single points of failure. Like all Firetide wireless infrastructure products, the HotPort 5020 delivers high reliability through its patented, self-healing AutoMesh™ technology, which ensures that the network remains available to high-bandwidth applications and always-on devices, even when the prevailing physical conditions are challenging. The 5020 wireless product line provides linear scalability when combined with the high-performance Firetide HotPort 7000 Series of wireless mesh nodes. "The Internet of Things is driving demand for more edge connectivity. Network architects and systems integrators looking to build advanced public safety, industrial automation, and service provider applications need a way to reliably attach an increasingly wide array of IP devices and sensors to the edge of a network," said John McCool, president and CEO of Firetide. "With the HotPort 5020, customers can now deliver the Firetide benefits of reliable bandwidth and redundancy right to the edge of their network at a cost-effective price point. With Firetide's AutoMesh technology platform, customers can start small and easily scale the network without pulling any fiber and with one consistent network and policy management -- effectively future-proofing their network." "By adding the 5020 to its product line, Firetide is offering a fast, edge-of-network node in a hardened outdoor package that is easily deployed," said Kenneth Giles of Giles Digital Construction, a Rockport, Texas-based installer of outdoor security equipment. "We have deployed multiple cameras per 5020 and it continues to deliver reliable, high bandwidth. The 5020 Series has started me thinking of all of the ways I can design new security systems, or extend previous deployments -- and that equals more business." A reliable and highly available service are two must-have attributes for critical applications, such as video, that current PTP/PTMP wireless network technologies generally cannot address. Further, the single-hop limitation associated with these approaches often results in the deployment of heterogeneous networks, often from different vendors, which bring additional integration and management complexities. Additionally, because multi-vendor approaches cannot deliver the robust, end-to-end security of an integrated core network-to-edge solution, these alternate approaches are inherently less secure. With the HotPort 5020, Firetide extends its highly secure wireless technology to the very edge of the network for data, video or voice applications -- and at a cost-effective price point that brings it within reach of applications that include critical broadband Internet access, reliable utilities, wireless parking meters, smart grid communications, and asset security and surveillance. High network availability. The HotPort 5020 can be deployed as a dual-radio version, which allows a second radio to be dedicated as the backup link. In case of failure on the primary link, there is a failover to the backup, minimizing downtime, less than 2 milliseconds between hand-off. Scalability without compromising throughput. A system designed with a combination of 7000 Series and 5020 nodes with AutoMesh can be linearly deployed for 15 hops with no need for fiber. At the same time, up to 15 5020 nodes can be attached to a single 7020 mesh node. End-to-end security. The Firetide HotPort 5020 employs 256-bit AES encryption. A network that features a combination of 5020 and 7020 mesh nodes can be managed as an end-to-end network, rather than as a series of links. This means customers can provision end-to-end security, quality of service, and policies across network segments. Rugged. All Firetide 5020 devices are clad in an all-weather IP66-rated enclosure with sturdy, stainless steel mounting brackets. Flexible. 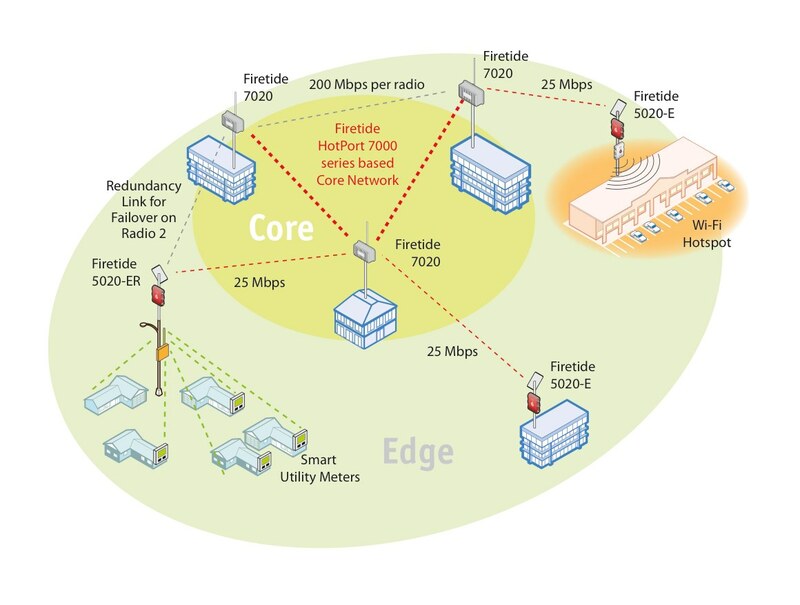 The Firetide HotPort 5020 Series can be ordered preconfigured as an edge mesh node in a PTMP connection or as PTP link in conjunction with another 5020 device. Firetide, headquartered in Silicon Valley, has more than 10,000 customers in 40 countries around the globe, including Seoul Metropolitan Rapid Transit, the City of Chicago and the world's longest mesh network at the Thailand Royal Irrigation Department. Most recently, the City of Scottsdale deployed a Firetide wireless mesh video surveillance network as part of its citywide Intelligent Transportation System covering 185 square miles with 90 Firetide wireless mesh nodes and management software. For more information, visit www.firetide.com or follow Firetide at @firetide. Firetide and AutoMesh are trademarks of Firetide Inc. All other company and product names are the trademarks of their respective owners. About this company Firetide Inc. Operators can use the HotPort 5020 to connect their edge devices onto existing Firetide mesh infrastructure networks in a cost-effective manner. The 5020 infrastructure node provides an optimum balance between cost and performance for data connectivity applications such as ITS, sensor backhaul, Wi-Fi/last mile backhaul, etc.